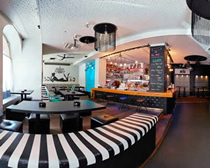 KU Bar & Lounge in Prague is a smart, cool place to spend a few hours, relaxing over drinks and listening to music. And it's well located, in between Wenceslas Square and the Old Town Square. The bar is popular with local Czechs and welcoming to tourists, which ensures a buzzing atmosphere most nights. Ku Bar offers a fine selection of cocktails made from the finest ingredients, and a choice of premium alcohol, plus wines, beers, homemade lemonades and other soft drinks. Champagne can also prove popular. While weekends are naturally busy, Ku Bar can attract a good crowd during the week too with promotions such as MAD MONDAYS, where drinks are really cheap. To order drinks, tables have tablets built into them. And you can use the tablets to chat to other tables too. Ku Bar has Czech and International DJs spinning the tunes every night. Music varies from happy and vocal house, to commercial dance, to RnB. KU Bar & Lounge opens a terrace in front of the bar in the warmer months. Quieter than inside, it is a good place for a few al fresco drinks and people watching.